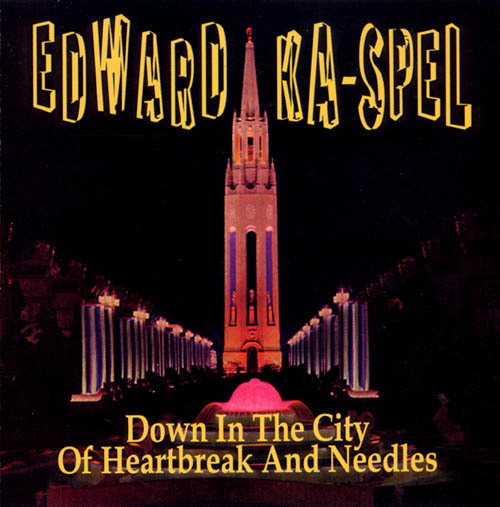 Edward Ka-Spel, "Down In The City Of Heartbreak And Needles"
The Angels - Where are you now that we need you? This compilation, released in 1995 by Soleilmoon Recordings, gathers onto one CD most of the first two years of Ka-Spel's solo output. Overlooking the Dance China Doll 12" of 1984, it includes half of 1984's Laugh China Doll (which, since the master tapes were destroyed by the weather, was mastered off of clean vinyl) and the entirety of 1985's Eyes China Doll, plus an unreleased track and three selections from a 1989 miscellany compilation entitled Perhaps We'll Only See a Thin Blue Line. Of all these odds and ends, the Eyes material is the strongest, as it contains more dynamic songs and memorable vocal performances, including the aggressive, mockingly-gothic "Avengelist," the powerful three-part symphony about "Hotel Blanc," and the only waltz in the world that celebrates explosive destruction, "The Char Char." It is interesting to note how often Ka-Spel references himself over the course of his output. In some cases, he re-records LPD tracks and vice-versa. Laugh's "Suicide Pact" is found here in its definitive version, but can also be found on the LPD's Stained Glass Soma Fountains. (It contains the refrain, "We're only faces in the fire!") The rhythmic "Lisa's Funeral" is one in a string of Lisa songs that started with LPD's "Lisa's Party" on Curse and continues through later Ka-Spel albums to appear for the last time (so far) on LPD's The Golden Age ("Lisa's Separation").